You can’t really go wrong with any combination of fresh vegetables this time of year but this Asian chop salad was made especially amazing by some local Napa cabbage and shitake mushrooms I was excited to find at the farmer’s market. Before chopping I started my vinaigrette by grating some ginger into a bowl of lemon juice, rice vinegar, and soy, with a few splashes of chili, sesame, and olive oil. 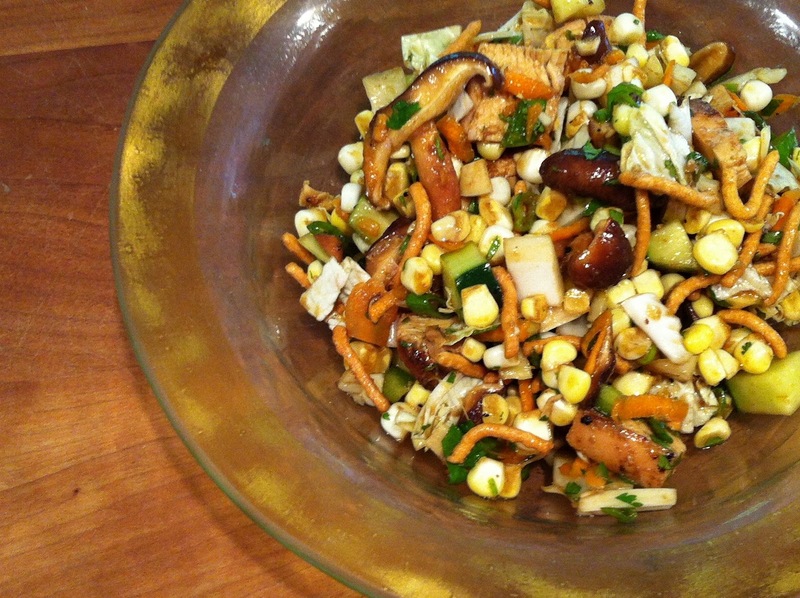 While it sat I husked the corn and sliced off the kernels into my salad bowl followed by the cabbage and mushrooms. I then chopped my cucumber, green pepper, cilantro, and jalapeno, followed by some grated carrot. I added some barbequed teriyaki marinated chicken breasts but definitely not necessary. I rarely use dried Chinese noodles but they make for a great Asian crunch, make sure to wait and add them at the end so they don’t get soggy along with kosher salt and pepper to taste.